Philadelphia is a city of neighborhoods...or so I'm told. New York is a city of neighborhoods. Chicago is a city of neighborhoods. Philadelphia? 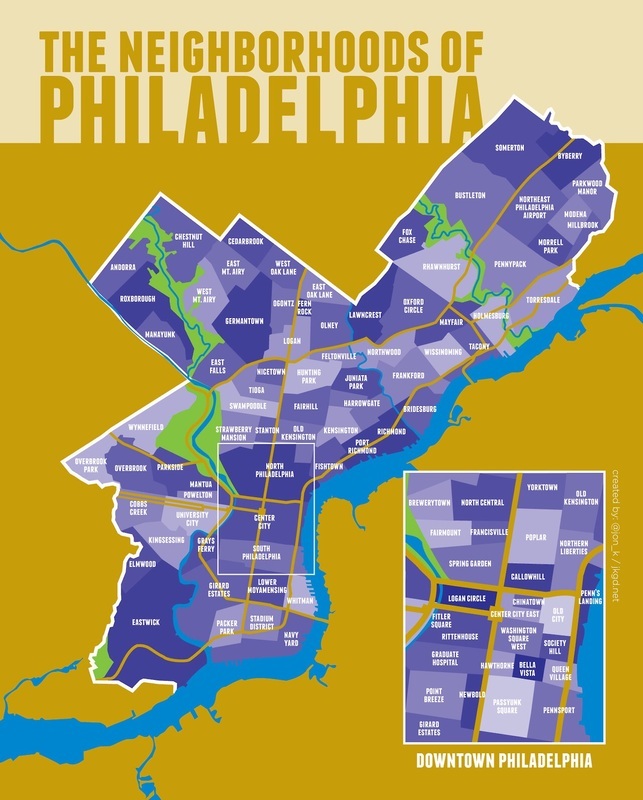 I'm not sure because unlike these other "neighborhood" cities Philadelphia's core is more compact and walkable meaning the neighborhoods weave into one another and blend compared to a New York or Chicago. Says downtown - more of a New York term - i.e. Philadelphia doesn't have a Mid-Town or Up-Town so what exactly is Down-Town, downtown from? Once the weather gets warmer I'll put together a few self guided walks. For all intents and purposes Center City is Philadelphia. Narrowly defining this here. Philadelphia has a gorgeous city hall...unfortunately the government isn't quite as gorgeous. A younger generation has been reinventing the neighborhood into a Go-To destination. America starts here. And evenings end here. High society in both a literal and figurative sense. So many great restaurants in this area I take it for granted. Still a great residential area but I think it's lost its mojo a bit in the past couple of years. ​A museum lined parkway. Still waiting to hit it's commercial stride. The Center City Ring is my own term. For years Philadelphia meant Center City. Other neighborhoods were decent but lacked the restaurants and coffee shops to serve as stops on a neighborhood tour. That's changed. Dramatically. Rugged. After years of slowly gentrifying this area is finally starting to reach its potential. A nice residential area although it's lost some of its cache to Fishtown, the neighborhood to the north. A street that reinvents itself. Reinvents itself. And reinvents itself again. A great residential area but not as much to see and do as Bella Vista. The Italian Market is great but there's a lot more here. A great combination of residential, restaurants, and attractions - plus it's close to the Schuylkill. Beyond the core. University gets some love. The rest of these places don't. I've lived in Center City. I've lived along South Street. I'll take Manayunk most days of the week. Home to the University of Pennsylvania and its sprawling campus. And Drexel. A hidden gem, under the radar, neighborhood with enough places to make for an afternoon or more. It's been booming...I think it's jumping the shark. Put on a blindfold. Take it off. Manayunk is distinct enough that you know immediately where you are. Up the hill from Manayunk. A great blue collar neighborhood. Do people know about East Falls? They should. Philadelphia's nicest neighborhood. Everyone else is fighting for second. Big difference between the West and East versions of these neighborhoods. A bit of an island. Years worth of missed opportunities.